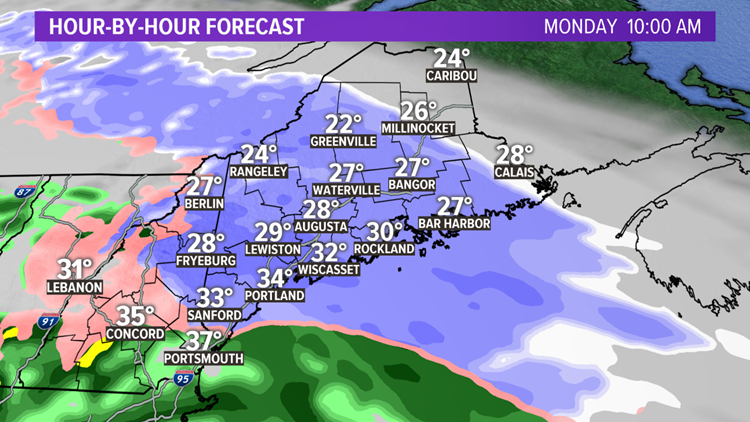 It will take until closer to 7 a.m. for snow to start in Bangor, and after that farther north and east. Periods of snow continue, heavy at times into the afternoon. Surface temperatures will be unusually chilly for this time of year, in the upper 20s and low 30s throughout the day. This will mean when the snow falls heavily, it will accumulate, even on pavement. Road treatments should be effective, but I’d expect a lot of greasy and slippery roads, especially farther inland and north. 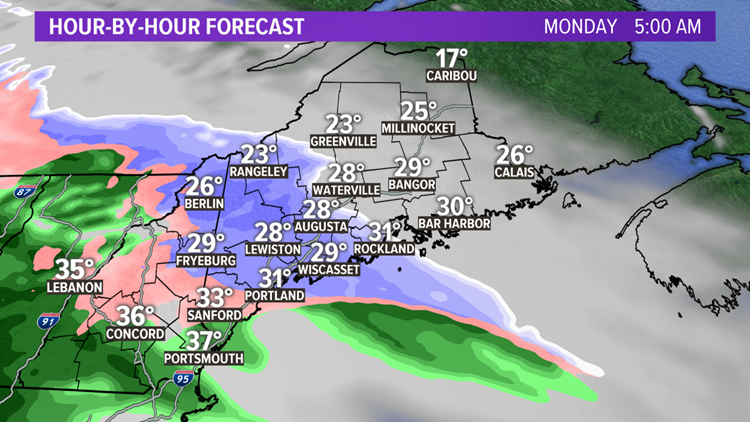 A rain/snow line will start to move north during the afternoon, changing western Maine to a mix with sleet and the Greater Portland area over to some rain at times. Much of York County will be wet in the afternoon, while it continues to snow farther north. 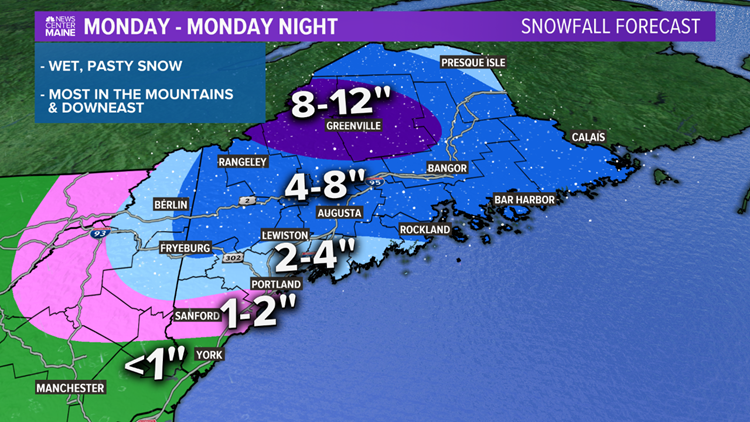 It will keep snowing into Monday night in eastern and northern Maine, and that’s where the highest totals should be. Snow totals are a challenge, the most will accumulate on the grass/already existing snow. But with unusually chilly air, some of the snow will accumulate on pavement too. 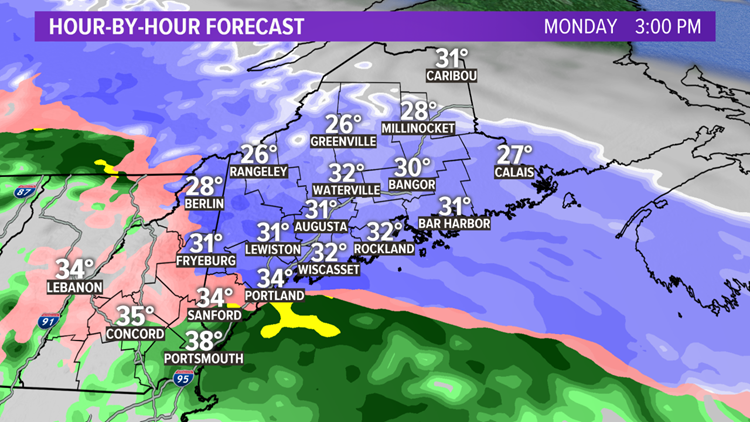 I expect 1-2″ from Portland south, 2-4″ from Portland north to Lewiston, including most of the Midcoast, and 4-8″ from Fryeburg and Lewiston north and east, including the Downeast coast and Bangor area. 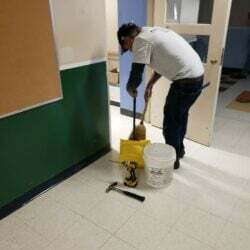 Some amounts over 8″ are possible in the mountains and hilly terrain. We get a break for a while Tuesday, before a second system moves in Tuesday afternoon and night. 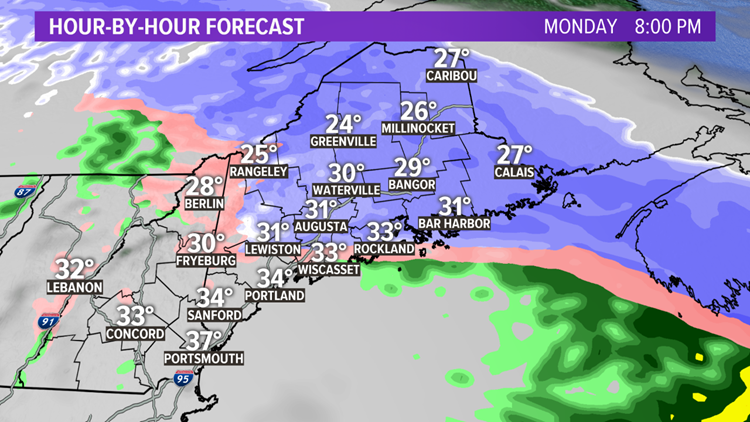 It’ll start as rain but flip to snow as temperatures fall in the evening. An additional 1 to 3 inches of snow seems likely by Wednesday morning in southern Maine, farther inland and in the mountains 3 to 5 inches of snow is possible. This part of the forecast is uncertain, so check back for updates.